A group of Southern Paua divers is concerned its members’ lives are being endangered by a shark tourism operation in Foveaux Strait. The divers are worried the Great White Southern Dive Company operation will encourage shark attacks and endanger divers. 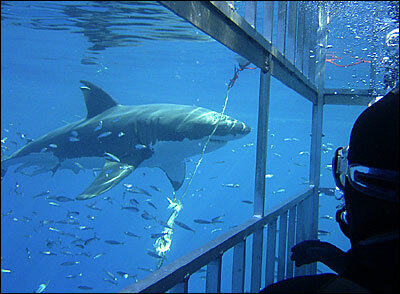 The company runs caged diving trips to view sharks. They claim the company drops minced tuna into the sea to attract the sharks – a practice known as chumming – and are concerned this may modify the great whites’ behaviour. Paua Management Area Council 5 chairman Storm Stanley said divers were really worried. “We feel there’s a real danger,” he said. An “explosion” of fur seals had attracted more sharks to southern waters, he said, adding that he was unsure how to overcome divers’ “fears of being chomped”. The problem had been discussed at a meeting involving divers, the company and the Department of Conservation, but Stewart Island commercial diver Ian Wilson said nothing had been properly resolved. “There’s still a lot of differences,” Mr Wilson said. DOC southern islands area manager Andy Roberts chaired the meeting but said the problem wasn’t easy to resolve because no organisation had jurisdiction. The company had approached DOC to develop guidelines on how it should operate, he said. “But DOC’s only point of concern is whether there’s going to be an impact on the sharks or not.” DOC was still waiting on legal advice, Mr Roberts said. Great White Southern Dive Company co-owner Peter Scott said he felt the meeting with divers had gone well. “There’s a couple of guys that still have issues with it. That’s their choice,” Mr Scott said. Sharks were blamed for killing one person in New Zealand every 13 years, on average, he said. The sharks were more likely to be attracted by fishing boats dumping scraps they could feed on than by his operation, he said. Stewart Island fisherman Garry Neave said he had seen many more great whites during the past four years, particularly in Halfmoon Bay, but was unsure what was attracting them to the area.